I had some stale sourdough bread and some tomato juice drained from a tin of chopped tomatoes. I thought I’d make panzanella with it. I had no red onion or cucumber, so this is my version. 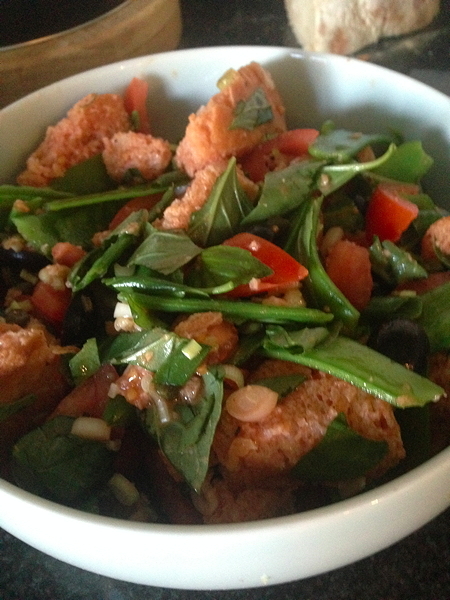 it’s panzanella ish. Whisk the tomato juice, oil, vinegar, salt and pepper together in a large bowl. add the bread and toss to coat every piece. Leave to stand for five minutes. Toss the rest of the ingredients, apart from the basil, into the bowl so that everything is coated in the dressing. Leave to stand at room temperature for about 20 minutes. Add basil, adjust seasoning and serve. It’s delicious.